Regarded by the world as one of the greatest empires to ever exist, the Roman Empire had many accomplishments that we are thankful for to this day. And Roman architecture is definitely one of them. The living testament to its glory are the constructions that still stand to this day, despite around 2000 years of fire, war, wear and scavenging people. 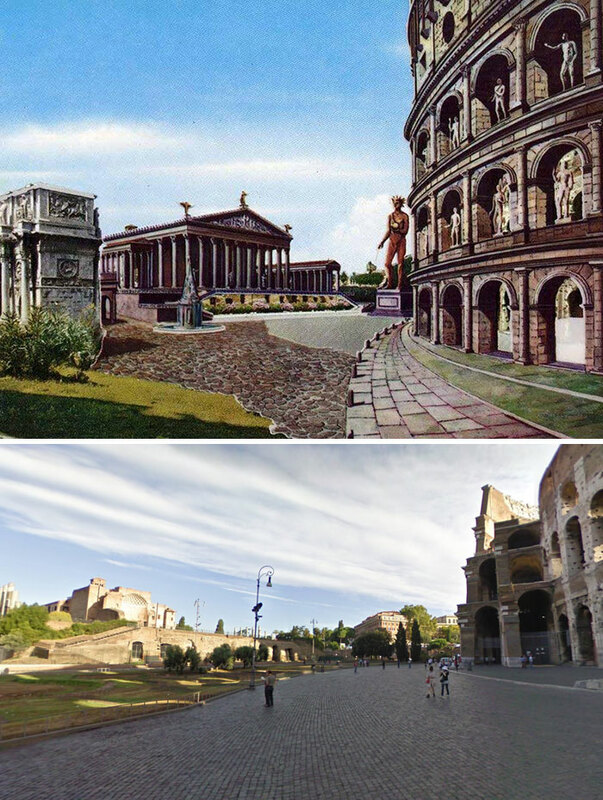 It’s hard to imagine modern day Rome without the Colosseum despite the fact that it stood to see the Empire rise and fall, hundreds of generations and cultures come and go. It always was and will be one of the greatest symbols of the Roman Empire. Yet while we see what is left in our day, it is always fascinating to see what the iconic structures looked like back in their glorious days. So scroll down below and check out these comparisons. The Circus Maximus was once a chariot-racing stadium and mass entertainment venue. It was the perfect place for ludi, public games held for the benefit and entertainment of the Roman people, which often lined up with various Roman religious festivals. Measuring 621 m (2,037 ft) in length and 118 m (387 ft) in width, it was the first and largest stadium in ancient Rome and the later Empire. It could house an impressive audience of over 150,000 spectators. 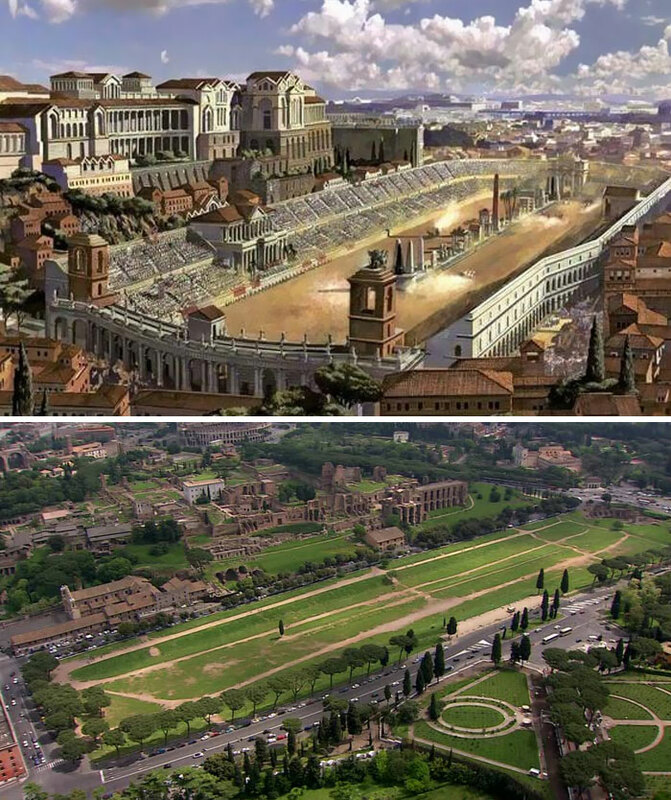 Thousands of years later, Circus Maximus is now a public park. What could be described as Rome’s signature structure, the Colosseum still stands as a breathtaking sight, despite being around 2000 years old. The amphitheatre, back in its glory, could hold an estimated number of 50,000 – 80,000 spectators. 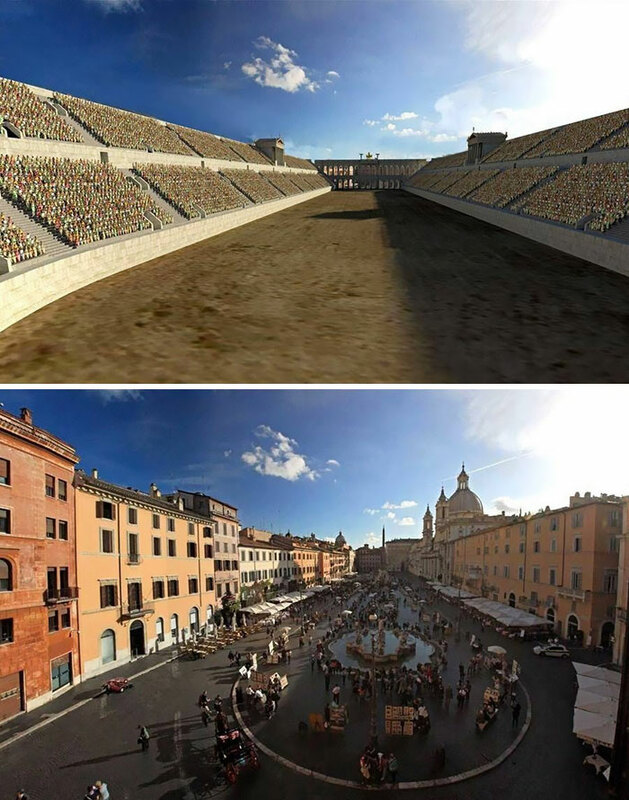 And people had a good reason to gather within the premises as the Flavian Amphitheatre offered such entertainment as gladiatorial contests, mock sea battles, animal hunts, executions, re-enactments of famous battles, and dramas based on mythology. Nowadays the Coliseum is one of Rome’s most popular tourist attractions, despite being damaged by earthquakes and stone-robbers over time. In 2007, New7Wonders Foundation chose the structure as one of the seven New7Wonders of the World. Commissioned by the Emperor Titus Flavius Domitianus in AD 80 as a gift to the people of Rome, the Stadium of Domitian was mostly used for athletic contests. 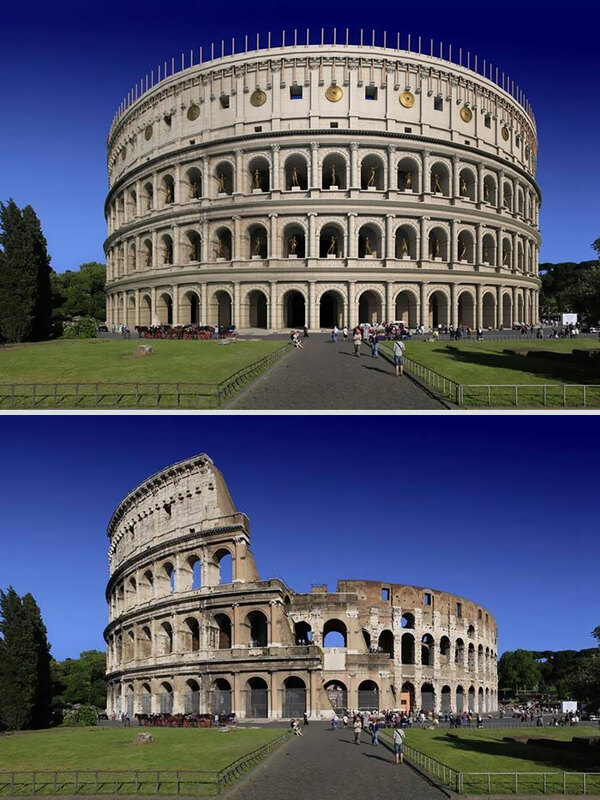 In AD 217, when the Colosseum suffered fire-damage, the Stadium was used for gladiator shows. As the Empire’s power diminished, the Stadium was used to house the poor. After the Renaissance, the structure was mined and robbed for building materials. Currently, Piazza Navona stands over the site of the Stadium of Domitian. 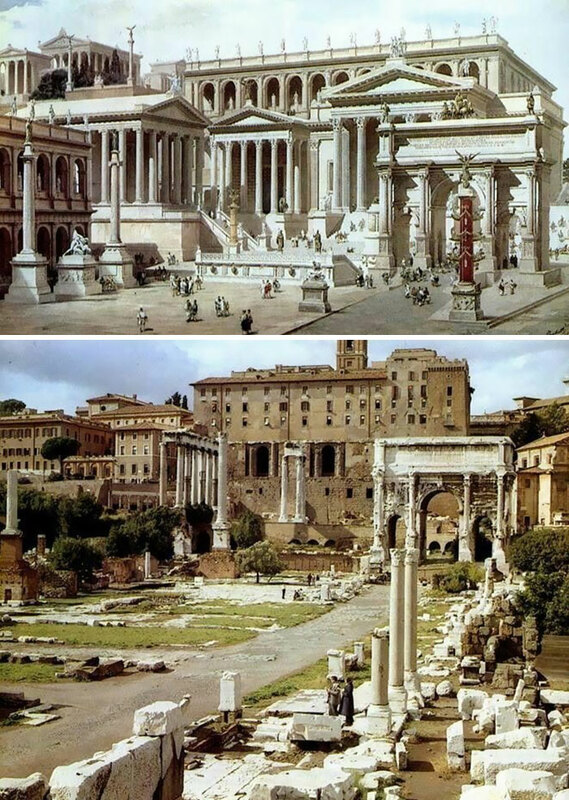 Located at the heart of the city of Rome, the Roman Forum is a a rectangular plaza surrounded by the ruins of several important ancient government buildings. At the height of the Empire glory, the site was the venue for public speeches, criminal trials, and gladiatorial matches as well as the commercial hub. 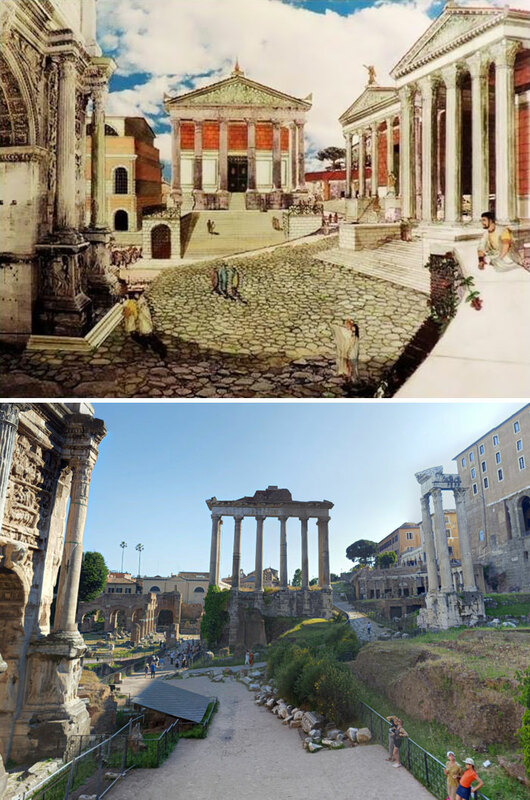 In later time, the site was the perfect spot for many artists and architects studying in Rome to sketch during the 17th through the 19th century. Nowadays, the Forum is a tourist attraction showcasing the ruins of some of the most important buildings ancient Rome had. Widely believed to once have been the largest temple in Ancient Rome, the Temple of Venus and Roma is located on the Velian Hill, right next to the Colosseum. Constructed in 135 AD, the temple was dedicated to the goddesses Venus Felix (“Venus the Bringer of Good Fortune”) and Roma Aeterna (“Eternal Rome”). It is believed that a severe earthquake in the 9th century destroyed the temple. Later, a church was built in its place, ordered by Pope Leo IV. Only a few columns of the old temple remain standing today.